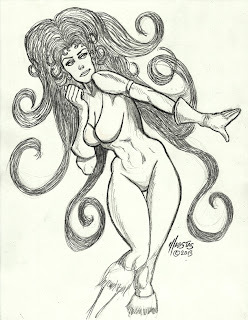 Honestly, I've never heard of the comic book heroine Medusa. I've heard of the Greek myth, so I guess it's along those lines. In any case, I probably redrew this one about 5 times. The most time spent was on the version before this- I roughed in the body and clumsily searched for a decent drawing with my pen work. It came out sloppy. So I redid it- I took my time with the pencils, trying to go for actual comic pencil rendering. It turned out pretty good, if I do say so myself. I love her pose. The hair needs work. I decided to leave it alone. No point in using pen and ink, and I think I'll stay away from inking for a while until I can get my pencils the way I want them. But when I do decide to do inks again, it will be with my crowquill pen and brush.